I have had a very nice weekend – a combination of social time, peaceful relaxing and garden pottering and some lovely knitting and sewing. I have finally finished all the clearing up, replacing dead things and generally detritus removing so as the post title says I can now relax and just keep on top of the weekly maintenance. I do love gardening I just hate that time of year when you seem to have so much boring stuff to do and this year there was so much frost damage it has taken about 2 months to get straight. But the clematis is in bloom and the lilies are just about to be so all is well with the world! I had some people round for my own Jamie at Home party on Friday – it went very well and everyone enjoyed it. You may remember I went to my friend Cheryl’s party a while ago and bought some very nice stuff and decided to have my own party. As a party host you get commission in the form of free goods and so I have lots of lovely new cooking stuff coming soon that I will post pics of! Also ordered some Xmas pressies for people -never too early you know – it creeps up on you! My lovely friend Kerry came round for a sewing day – she is doing some more goldwork – got no pics to show as we did more chatting than actual sewing but I got four more pairs of brais cut out for some of the guys in the medieval group. Just need to sew them up this weekend in time for the next show on the next Bank Holiday. In between gardening and sewing we went to see Robin Hood with Russell Crowe which I thought was very good. My friend Darren was in it as one of the swordsmen (think I did spot him in a couple of scenes but it all was a bit fast and furious at times!). Costumes were very good – obviously Robin spends most of his time looking a bit grungy but King John was dressed very wonderfully – I got very excited at one point as the gown he wears in one of his early scenes is made of exactly the same material that I have in my stash – bought at one of our medieval markets a while ago. I couldn’t find any pics of that one but the pic below shows an equally lovely outfit. Will have to buy the film on DVD so that I can pause frames and study things in more detail! 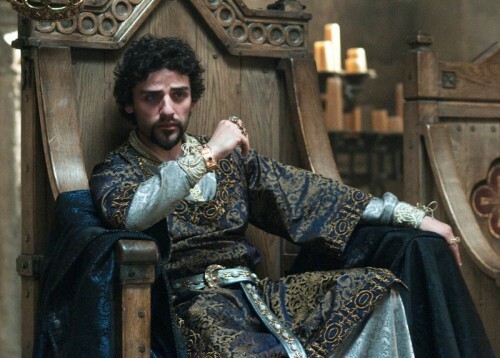 King John - I know he was horrible (and played very well by Oscar Isaac) but he has fab clothes! So that this is not an entirely craft pic free post I will show you some of my good friend Barbara’s work – I have been meaning to post these for a while. Barbara (no blog) does the most beautiful tea cosies and these are some of her works – in the style of Poppy Treffry. And the back with very cute cupcakes! Will also share with you some more pics of lovely Ellie and her social life (which involves far more dressing up and far less knitting than mine!). Here she is on a friend’s birthday celebration as a Star Trek babe – ‘phasers to stun’ seems a very appropriate caption as she really does look stunning in the little red dress. 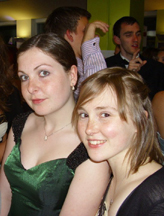 She has now finished her first year at Uni (!) so went to the Summer Ball this weekend in a fab vintage gown that she bought last year in Spain. It is green taffeta with gorgeous beaded shoulder straps. I am very proud of her once again as she has settled in so well – made loads of friends, is doing really well with her work and has organised a house for the next two years all by herself. She has also got two jobs – one doing voluntary work for the National Trust which will be fab for her CV and some paid work as a student ambassador where she will be involved in Open Days and Uni events such as September’s Freshers’ Week where she will be a very savvy second year! And she has managed to stay in budget all year and save money for her forthcoming holiday to Spain which is wonderful. Jake has just started his GCSE exams – he came home today with writer’s cramp from his RE exam. Only a few weeks to go and it will all be over. We are going out on Sat to organise his suit for the Prom – limo all sorted and he is looking for a top hat on Ebay as we speak – I knew that giving them a dressing up box when they were little would be a good idea! Hope you have a lovely week ahead – thanks for visiting.